The Kwara State Police Command has presented 16 suspected hoodlums and 11 cultists that were allegedly terrorising innocent people within Ilorin metropolis. The State’s Commissioner of Police, Aminu Saleh disclosed this on Wednesday, while presenting the suspects at the police headquarters Ilorin to newsmen. 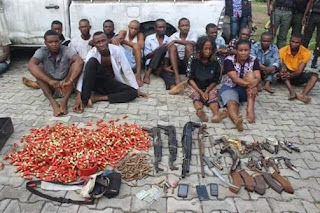 Saleh said that 11 cultists were arrested on September 15, while they were fighting at their hide-out named ‘evil spirit’, along Amilegbe area, Ilorin. He said the suspected cultists arrested were Idowu Ibrahim, Sikiru Ganiyu, Kareem Jamiu, Akeem Wahab, Musa Aremu and Afolabi Ibrahim. Others were Usman Salihu, Ganiyu Alabi, Janet Victoria, Hassanat Abdulahi and Mustapha Teslim. He also said that 5 suspected hoodlums were arrested on September 24 with a Mazda registration number FUF 646 XA kwara taxi colour, in which they used to defraud innocent commuters. He said further that the suspects were Adebayo Akeem, Sesan Ogunga, Owoyemi Gbenga, Sebile Oluwafemi and Ayoola Isaac. He said the suspects conspired and defrauded one Adekeye Feyisayo, Bilikis Abdulkareem and five other victims, of their money totalling N3.5 million by deceiving them with fake foreign currencies. The police boss said that 12 suspected hoodlums were arrested on September 25 during police patrol along Fate and Sango area, Ilorin and when they were searched, one locally made pistol, one live cartridge, one Dane gun, some parcel of weeds suspected to be India hemp among others were recovered from them. According to him, the names of the suspects are: Abdurasheed Sakariyahu, Saadu Laro, Shola Olatunji, Raheem Ismaila, Emmanuel Adeniyi, Segun Fagbemi, Olarewaju Iliasu, Ibrahim Babatunde, Abubakar Nureni Oladimeji Abdullahi, Owolabi Wasiu and Abubakar Ibrahim. The CP advised the members of the public to always provide useful information to the police and urged them to be vigilant of happenings around their environment. He said the suspects would be charged to court after the investigation.